More than 70 years after the Holocaust, eyewitness testimonies are assuming increasingly central roles in Holocaust education and remembrance. 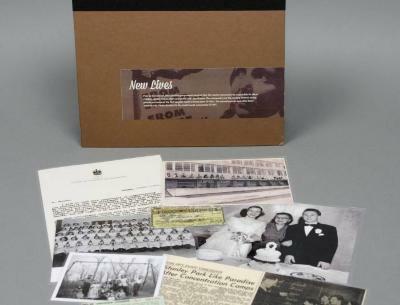 The VHEC Collection holds more than 200 video-recorded testimonies of local Holocaust survivors, including concentration camp survivors, child survivors, partisans and those who survived in hiding. The collection also includes eyewitness testimonies from aid-givers, members of the resistance, liberators and military personnel who witnessed the aftermath of the Holocaust. The testimonies date back to the late 1970s and continue today. They are recommended for secondary high school students. Synopses of most testimonies are included as part of the testimony's catalogue record and in many cases time-coded summaries in a searchable PDF format are also available. To find out more about the history of the VHEC Holocaust Testimony Collection please visit: History of the Holocaust Testimony Collection. The term testimony is often used to describe the personal account of a Holocaust survivor. Testimony is given as an act of witness and a form of evidence. The VHEC recommends not using the term "story" because it implies a fictionalized or constructed account. The Holocaust is an event that has compelled many of those who experienced it to assume the role of witness to the criminal events for which there were few trials or convictions. Survivors' Holocaust testimonies are part of their larger oral history, including life before and after the Holocaust. These oral histories attest to a destroyed way of life and a loss of communities and cultures. In recounting their experiences, survivors remember their past, their community, their family and their identity. Through the recounting of their experiences, survivors frame and make sense of an experience that is hard, even for them, to grasp or believe. Survivors write and record their experiences to preserve them and gather them into a form that confers meaning. The key here is the word experience, which belongs to the consciousness of a person; it arises in the encounter between the world of experience and one's thoughts and sense of self. It is the survivor's experience that that is a privilege to hear. Survivors often speak of a sense of obligation to tell the world what happened, which provided a strong sense of purpose for survival during the Holocaust. For many, the responsibility of survival is unfulfilled unless they speak or write about their experience. Survivors are motivated to bear witness and honour the memory of lost family members. They are also motivated by acts of racism and genocide in the present and the desire to encourage young people to make a difference. Survivors focus of their lived experience. What they experienced may not always be in alignment with an historian's perspective of history. In their testimonies, survivors share their lived experience from before, during and after the Holocaust. Their testimonies are offered as personal, eyewitness accounts. Their experiences may not always resemble a historian's view of history. Educators are encouraged to provide context and historical background to students. They should be aware of the fact that any first person account is limited by several variables, including the age, gender and country of origin of the interviewee. Some survivors were caught up early, others later, in the war. Some survived in hiding, others spent the war in labour camps, death camps, or partisan and resistance groups. Educators should ask students to alert to be these variables and to understand that each testimony is one person's personal account. Teachers may use the Holocaust Education Teacher Resource in order to provide historical context. This general resource contains guidelines for teaching about the Holocaust, frequently asked questions about the Holocaust, a timeline, a glossary, as well as recommended readings in print and online. 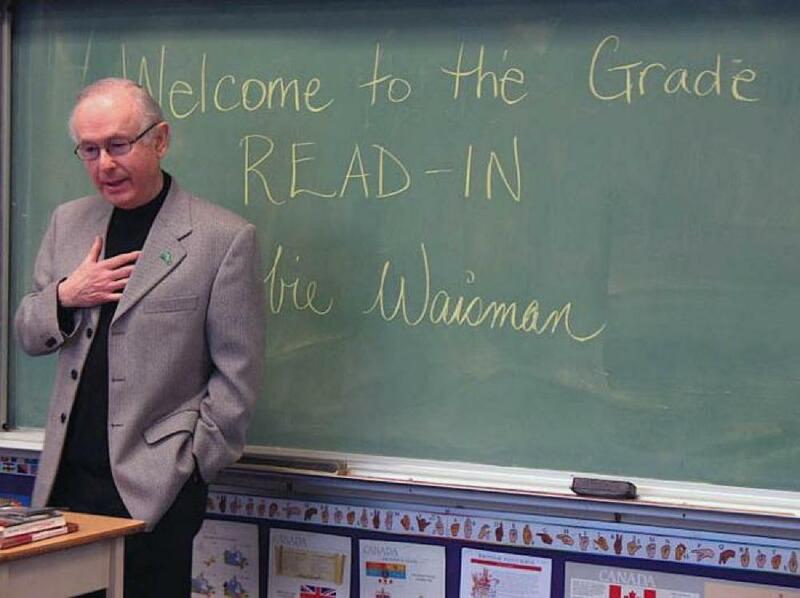 In addition to providing a historical overview of the Holocaust, educators may want to have students read a survivor's memoir or a book of youth fiction about the Holocaust before viewing testimony or hearing a speaker. Teachers may ask students to keep journals to help them reflect on what they hear during survivor testimony. Journals can be used by educators to carry on a dialogue with students about a variety of related issues. To support teaching through testimonies, the VHEC developed Primary Voices, an online resource for students to complement engagement with testimony. 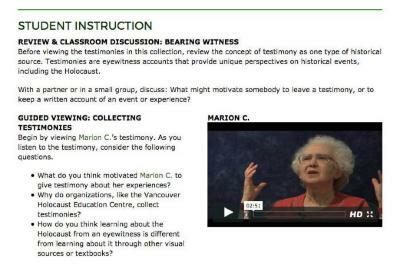 Primary Voices is a VHEC-produced online resource for educators and students to engage with Holocaust testimony in lessons or through independent research. Primary Voices provides learning opportunities that support historical thinking and engagement with primary and secondary sources. Primary Voices fosters personalized and inquiry-based learning, which are prominent features of the British Columbia provincial curriculum. The lessons in Primary Voices are clustered into themes linked to the testimonies in the VHEC collection as well as to topics of particular relevance to the history of the Holocaust. Excerpts from the testimonies are included in the website and can be streamed into the classroom. The lessons in Primary Voices are recommended for students of grades eight through 12, with adaptations possible for intermediate grades. Students can browse the testimony collection and filter results by creation date, subject, people and places to explore testimonies relevant to their lesson or topic under study. Testimonies are described individually in catalogue records and include a synopsis of the testimony. These records make it possible for students to investigate testimonies independently. Through such inquiry, students can place the testimonies in their institutional and historical context and discover for themselves the unique Holocaust perspective testimonies represent. Excerpts for select testimonies are included through the individual record and, where available, can be streamed into the classroom. Teachers who wish to show a testimony that contains particular content or themes may contact the Collections staff for suggestions by phoning 604-264-0499 or emailing collections@vhec.org. The individual record for each testimony in the online catalogue contains links to other items in the VHEC Collection with the same subject matter heading (called access points). The individual record also contains links to related holdings by place, people and organizations, and events and exhibitions. Exploring links to related items gives students the opportunity to compare how different sources of historic evidence speak to common themes, historic events, people or places.